Today I am excited to have a guest interview with Cara Koscinski, OTR/L and co-author of The Weighted Blanket Guide. This post was originally used as part of an hour long live Facebook party in my Growing Hands-On Kids Community Facebook Group. You can join there if you'd like to read the comments/questions and answers throughout the party. 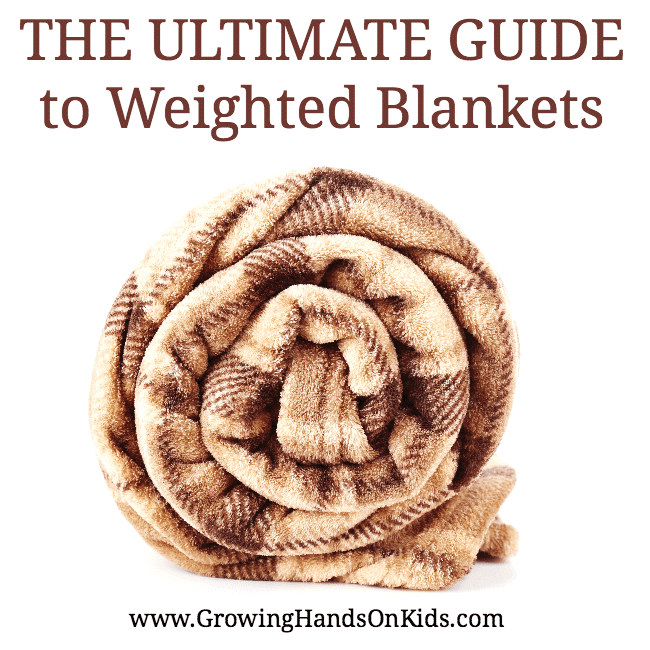 Cara has graciously allowed me to turn the information she shared into a post and compile the ultimate guide to weighted blankets for you today! Basically, a weighted blanket is two pieces of fabric sewn together into squares to give even weight distribution. They have been around for a long time, but their use is becoming popular as their benefits and information about them has spread/grown. Weighted blankets are not for keeping warm, but for adding weighted to our body for various purposes. The neat thing is that they are known to benefit people with SO many disorder including: autism, SPD, PTSD, chemotherapy, dementia, Fetal Alcohol Syndrome, multiple sclerosis, detoxing, ADHD, and many others. Also, the results can be felt within seconds of putting on a weighted blanket! The science behind weighted blankets – What do the studies say? The BIGGEST misconception about weighted blankets is that there is a ‘standard’ for application, weight, and wearing time! The fact is, that there is actually limited formal research about weighted blankets. No absolutes nor magic formulas are in existence. This surprised me the most as I wrote the book. Some OTs have been recently been completing research in mental health clinics and have published limited studies. Several groups have attempted to establish guidelines about the use of blankets, however, there has been a cloud of fear surrounding the blankets. This is due to a few deaths that MAY have been caused by weighted blanket use. Upon further review, the blankets in question were applied incorrectly, sometimes even wrapping the child’s face in the blanket. I personally spoke with Temple Grandin about her ‘squeeze machines’ and the use of weight/pressure. We agreed that weighted blankets work well or don’t work at all. In other words, they work well for those who respond to pressure and tactile input. When writing the book, my co-author and I did our own research by questionnaire and found many consistencies among therapists and blanket companies: The guideline of 10% plus one pound has spread wildly on-line. It can be a great starting point however, extreme caution should be used when applied to younger children. Also, NEVER use a weighted blanket for children younger than three years old OR anyone who cannot remove it. How does deep pressure affect the body and why is it beneficial? Deep pressure stimulates certain tactile receptors in the skin and when moving against a weighted blanket, users gain proprioceptive input. Generally, deep pressure sensation is calming and helps to regulate our sensory systems. The feeling of the weighted blanket can feel like a hug. The chemical, oxytocin acts on our limbic systems. This chemical can decrease anxiety and stress. Also, dopamine released during hugs or even anticipation of hugs can decrease heart rate, increase ability to fight infections, and/or decrease blood pressure! Since each person’s sensory system responds differently, the best way to see how the pressure of weighted blankets feel is to try them! They generally either work well or don’t work at all…..so person specific. Who benefits from using weighted blankets? Honestly, anyone can benefit! We all have sensory systems that can become dys-regulated and vary due to genetic and environmental factors. We NEVER recommend use on infants, those under three, and those who (for physical or cognitive reasons) cannot independently remove them. The benefits of the blankets are world-wide and vast! It’s truly exciting that something non-medical can provide such a great benefit. Do I need an OT eval to get a weighted blanket? Anyone can purchase a weighted blanket through various companies. Here, in our city, a local non-profit company requires that the treating therapist picks-up the blanket. I feel this is best-practice. Any sensory diet or activity should be supervised by a certified Occupational Therapist (OT). We are specifically trained in the use of sensory-based interventions for therapeutic benefit. Since the weighted blanket can be a powerful therapy tool, frequent consultation with an OT for monitoring and re-evaluation is necessary. 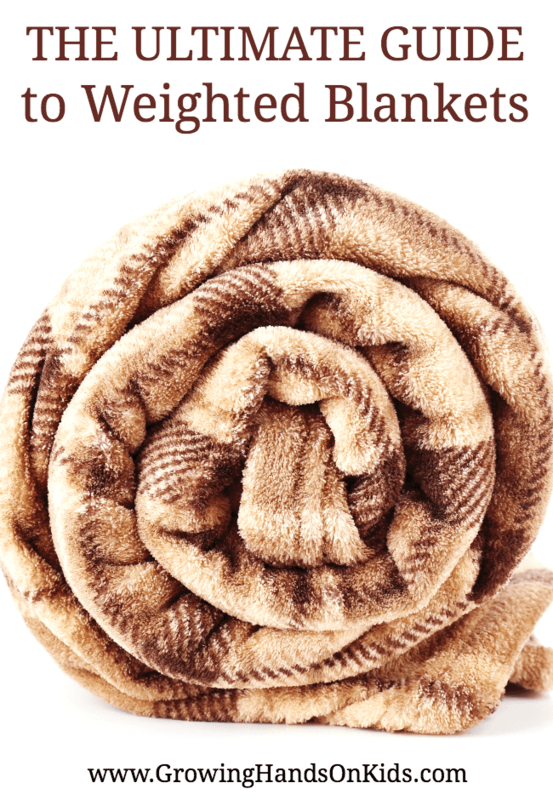 It’s important for parents, schools, aides to know how to carry-over the blanket use. Are there any guidelines for weighted blankets we should be aware of? I suggest using as little weight as is therapeutically necessary. Remember, the popular ‘myth’ of 20 minutes off and 20 minutes on is just that, a myth! Also, ensure the child can remove the blanket whenever he/she desires. Never use on a child who is unable to remove it. Wearing time depends on individual preference so make sure a blanket is available in any area where calming is designated. Try it both lying and seated to see what feels best. When are weighted blankets beneficial? It really depends on user preference. Use them when feeling upset, anxious, stressed. They are awesome for sensory rooms, too. Helping users to feel more in control is a great benefit of weighted blankets. They are even being used in mindfulness and grounding techniques. Check out the book, The Weighted Blanket Guide for a thorough tutorial about making your own blanket. They also provide helpful tips for materials, weight, and even getting blankets covered by insurance companies! Cara Koscinski is a veteran (20 year) pediatric OT and founder of The Pocket Occupational Therapist. Her two sons are both on the autism spectrum and have sensory processing disorder. Her younger son has mitochondrial disease and uses a feeding tube for nourishment. At times, he requires a wheelchair to get around. She believes her experience as a special needs mom give her unique empathy for her clients and their families. She also loves speaking across the US for Future Horizons along with Temple Grandin, presenting several continuing education courses around the world, and is the OT Advisor to Asperkids and Autism Asperger’s Digest. She is also the author of “The Parent’s Guide to Occupational Therapy for Autism & Special Needs”, “The Special Needs SCHOOL Survival Guide”, and “The Weighted Blanket Guide“. You can find Cara on her blog, The Pocket OT and also on Facebook. For more tips like this one, follow my Occupational Therapy Pinterest board below.